FEATURES – The Kitchen Active® Spiral Slicer is molded using HIGH QUALITY ABS plastic for a lightweight feel, fitted with TOP-QUALITY STAINLESS STEEL Japanese blades for the sharpest and quickest slice of pasta. It fits in your hand, so it’s easy to store. It’s dishwasher safe for an easy clean. The plastic is BPA-FREE. And once the veggie you’re spiral-slicing gets small enough, use the provided cap to MINIMIZE WASTAGE. 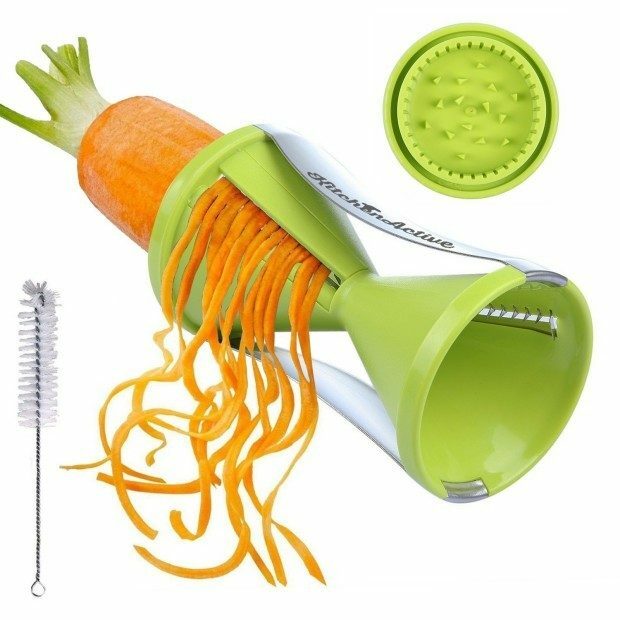 In short – it’s everything you could ask from a vegetable peeler. IT’S ALSO A GREAT GIFT! Whether it’s for a special occasion or just because, this Spiral Slicer is the perfect gift for anyone who spends a lot of time in the kitchen. From busy moms to college students to culinary artists, this product is a definite must-have for anyone who wants to get more veggies into their diet – in a quick and easy way.